A router with a brain and a droning buzz grinds fancy patterns in hypnotic sweeps across wood, metal and acrylic — common sights and sounds at McGrew Cabinetmakers and the signs of a business plugged into technology. About four years ago, Jim McGrew brought himself and his company into the digital age. “It’s getting so that you have to embrace technology in this business. Otherwise you lose out on a lot of opportunities. For me, automation is a moneymaker, a time-saver and many times it eliminates outsourcing,” he says. 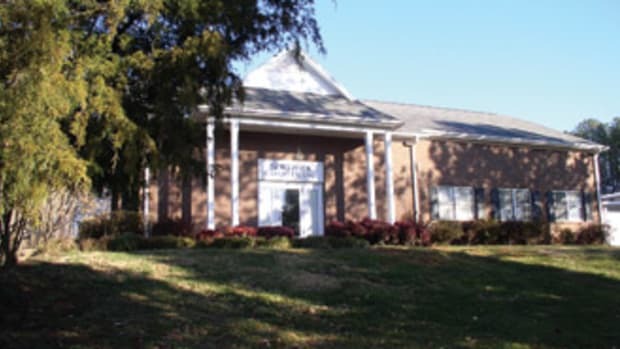 Location: Columbia, S.C. • Shop size: 23,000 sq. 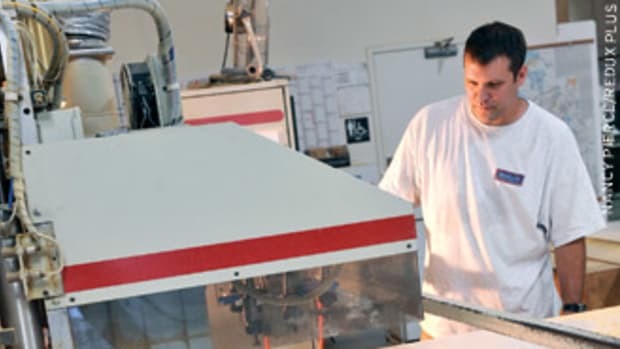 ft. Years in business: 26 Employees: Four full time, four part time Gross in 2010: $500,000 Business focus: Custom commercial cabinetry, including CNC router embellishments, for corporate offices, military bases, health facilities and parks. Majority of services performed in the Carolinas. Equipment: Brandt KD-54 edgebander; Delta Unisaw planer and joiner; SCMI 320 slide table saw; Williams & Hussey molder; CAMaster 508 CNC router, Aspire 3-D software. It wasn’t long before he purchased a larger machine and went macro when a friend and chess enthusiast asked him if he could build a life-sized 3-D chess set. In true form, he jumped on the idea. “ ‘Can’t’ isn’t in our vocabulary. We made six pieces and they’ve gotten a lot of publicity and have shown up as conversation pieces at airports, lobbies and theaters.” After winning the chess challenge, he was ready to take on the world of decorative art. He began querying clients about adding “fluted columns, flowers, motifs or how about your name?” The technology has carved a sizeable niche — close to 20 percent — in his business. Not only did McGrew sign on to CNC routing, but he enhanced his collection of desktop computer software. His Aspire, WinCNC and Cabnetware packages are cornerstones of his technical applications. 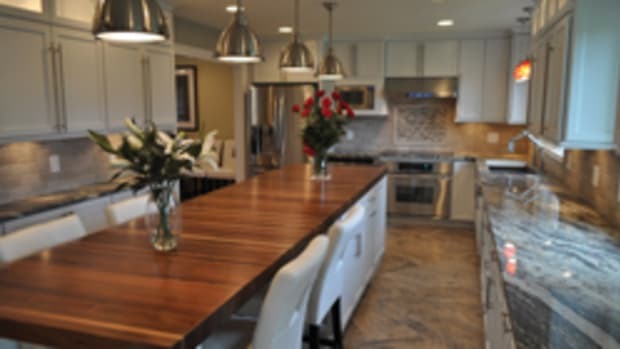 They improve his presentations by providing virtual kitchen plans as well as layouts and quotes for cabinet projects. He insists on commercial architectural drawings in PDF format so he can apply his “calipers” app to determine accurate construction measurements. “What I spend on computer software comes right back in the continued success of this business,” he says. But McGrew doesn’t have time to daydream about teaching in a classroom because more serious thinking is demanded to handle the sea of details for current projects. His 120-day backlog includes fabricating and installing trophy cases at the University of South Carolina’s baseball stadium. The commission is typical of much of his multimedia work — aluminum bases machined on the CNC router, poplar frames and opaque acrylic enclosures. 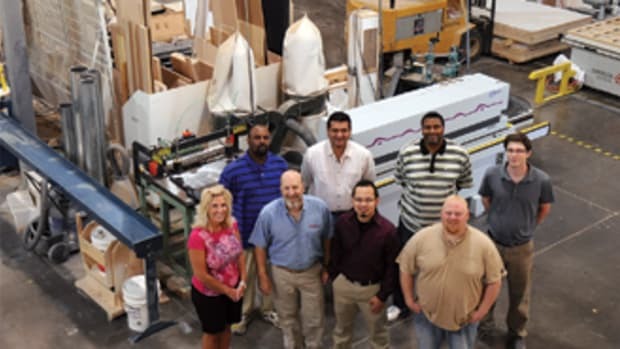 Signs, carved plaques and symbols have become a favorite part of the company’s portfolio. 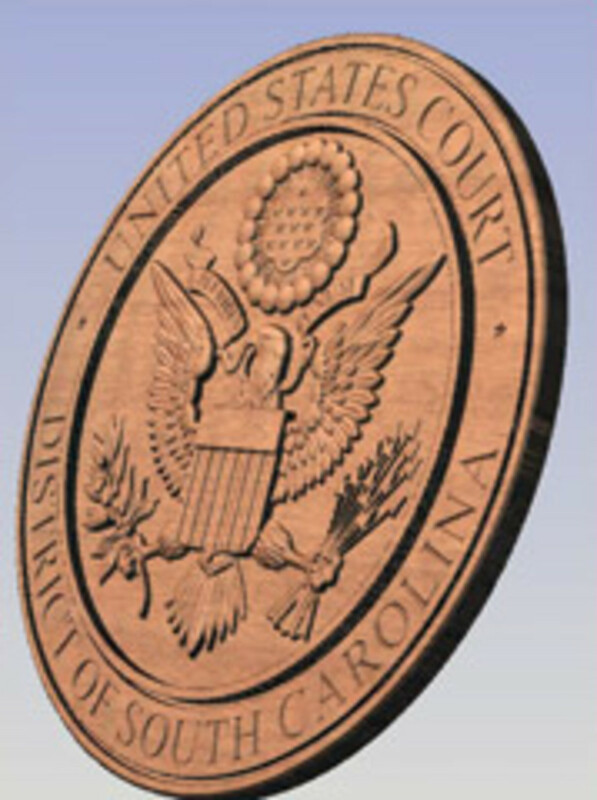 Propped up against the CNC router is an oak oval engraved with the state’s Supreme Court seal. McGrew is in the refinement stage of duplicating the official intricate design of eagle and sheaves of grain. He recently completed a 72” walnut carving of the Marine Corps emblem that is mounted on the interior of the Officers Club at the Air Station in Cherry Point, N.C.
McGrew considers an installation at the federal courthouse in Charleston, S.C., in 2006 to be a standout project because he’s consulted the plans over and over until they’ve become an essential reference. 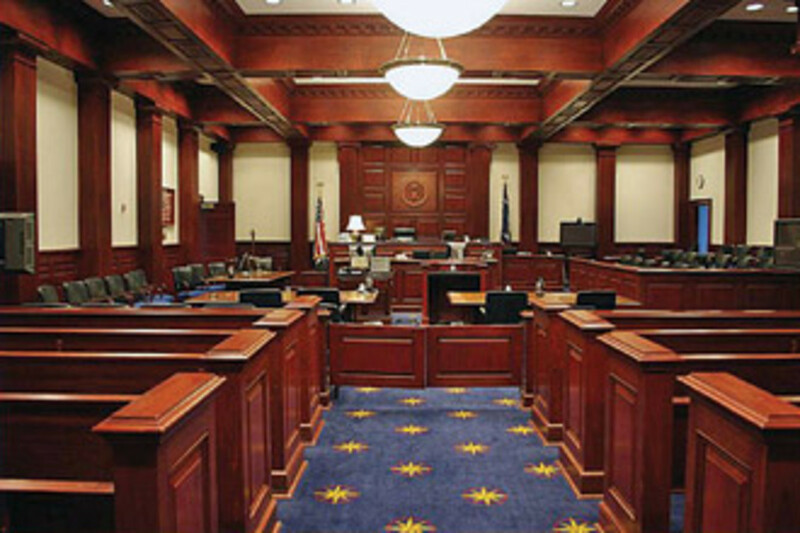 “I use them as a guide for techniques used for many other installations.” The company was responsible for several features in the courtroom including wainscoting, columns, the judge’s bench and jury seating. In addition to McGrew’s archive of plans for all the jobs he’s ever done, he depends on two important reference books that supplement his design knowledge: Architectural Graphic Standards, which his dad gave him many years ago, and the Architectural Woodworking Institute spec manual. Both are crucial in achieving correct drawings and proportions, he says. For about 10 years before the shop had a CNC router, it seemed to McGrew as though he had remodeled a kitchen for everyone in Columbia. “I couldn’t go to a restaurant or about town without someone referencing me as the person who did their new kitchen.” He completed an average of 40 domestic kitchens a year; in 2006, it was less than 10. Now he usually foregoes residential work because he has enough commercial business to keep him and his crew busy. His bread-and-butter comes courtesy of five major contractors who have favored him for jobs for more than a decade. McGrew has also picked up work from several small woodworkers who closed up shop during the recession. Big bay doors open into a sprawling three-part shop complex — 10,000 sq. ft. for machining, 11,000 sq. ft. for fabrication and a 2,000-sq.-ft. finishing room. “When we signed the lease in 2008 and moved in, it seemed bigger than our needs, but our other places had been somewhat cramped. 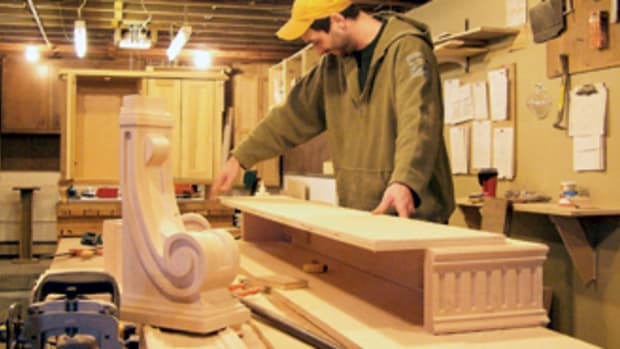 Now I’m glad we took this because we got a good deal on it during the real estate downturn and we have plenty of room to spread out and expand if we need to.” The move also inspired a name change from McGrew Architectural Woodwork to McGrew Cabinetmakers to convey a more traditional aspect. In essence, the company is a high-tech entity infused with an Old World personality. With a Bluetooth plugged in his ear, McGrew ambles with purpose from office to fabrication area while fielding myriad phone calls. In his wide-open presence, he pauses at a workstation to assess progress, his perceptive green eyes reflecting a broad spectrum of intuitive knowledge and experience. He’s glad not to have to get behind a saw anymore. After 26 years in the business, wrestling with wood and doing heavy lifting have given him carpel tunnel syndrome in both hands and a banged-up right thumb deeply gouged at least twice. He’s perfectly content to let his capable employees do the real woodworking while he oversees day-to-day activities. 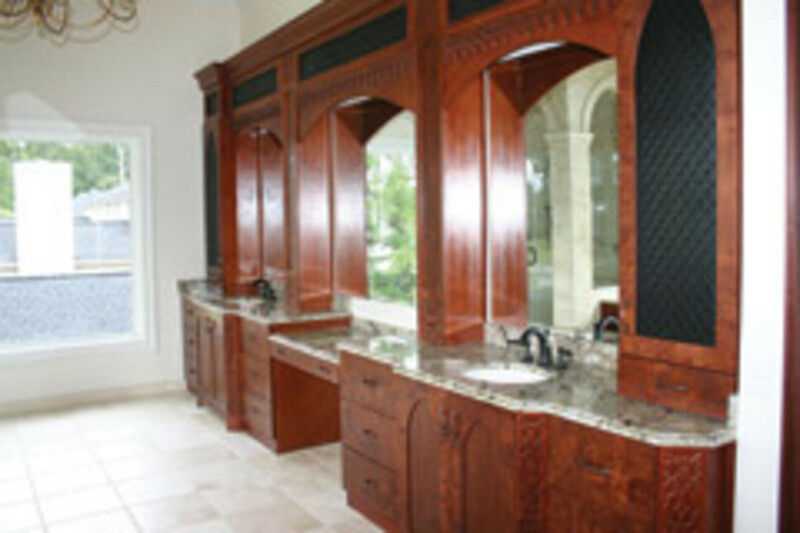 An exception is CNC router work in which he often has a hand just for the fun of it. 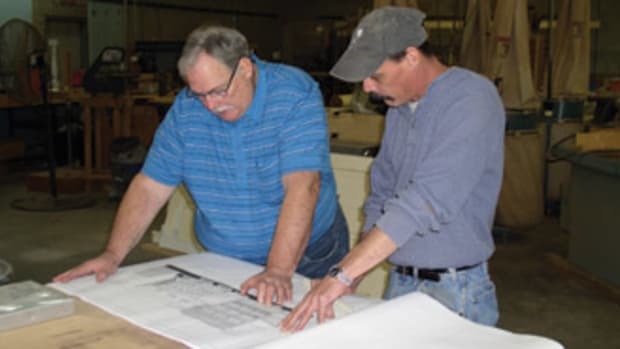 He basically handles all the desk work — legal matters, drawings, plans and money — and his co-worker, Robert Sharpe, manages the shop and installation. 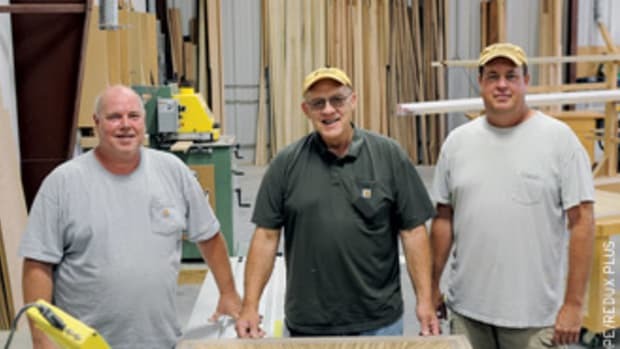 His four full-time employees — one assistant, two cabinetmakers and one finisher — say McGrew is mostly business with a streak of good humor. Though he pulls no punches, he’s flexible when he needs to be, as long as his rules aren’t violated. “The fellas must want to be here, they must be honest and let me know when they have obligations to their families, and they must not have two bad days in a row. No drugs or alcohol. No torn jeans or unkempt appearance. I suggest they buy a pair of Carhartts that look good and stand up to shop work.” And why these rules? McGrew contends that violating any or all of them creates bad karma that permeates the entire shop and causes unnecessary stress. McGrew is a seasoned entrepreneur who’s viewed the world from many perspectives. He got an early start at 18 when he designed his first restaurant in downtown Columbia as a course assignment. At the time, he was a student at the University of South Carolina, majoring in restaurant management and facility planning. Eventually, he took a job at the eatery to pay tuition for two years. At 19, he enlisted in the Navy and shipped out to Gaeta, Italy. After serving three years, he was discharged. With sea legs intact, he went on a sailing spree, crewing yachts in the Mediterranean. His journeys took him to the Caribbean where he bought, built and developed a restaurant and marina on the Virgin Islands. After 10 years, he sold his real estate holdings and repatriated back to Columbia where he continued his studies at the university and simultaneously worked in the construction industry. 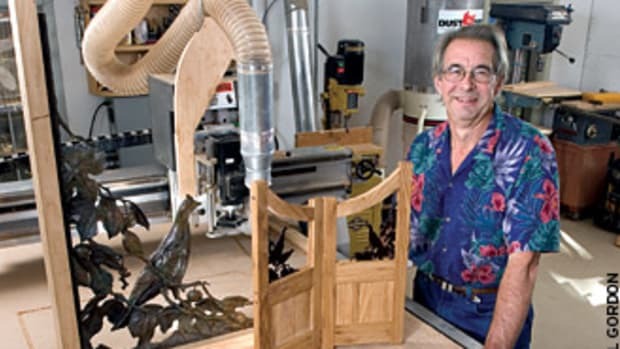 In 1985, McGrew launched his woodworking career when he founded Custom Restaurants and Taverns in Columbia. The company specialized in designing and constructing furniture and bars for the restaurant industry and operated mainly in the Carolinas, Georgia and Washington, D.C. “The ironic part of it is that even though I planned and built restaurants, I didn’t cook then and I don’t do any cooking now. Don’t get me wrong. I like to eat, but it was the design and operation I was interested in back then.” He seemed to gravitate toward projects that made money, in spite of the fact that riches were never his goal. His aim has always been to satisfy his own monetary needs and those of his employees and their families. What is the secret to McGrew’s professional success? Simply, in his own words, “Suit up, show up and never give up.” He reflects a healthy confidence and adaptability with a dab of uncertainty as each job comes through the door and observes that his life has been punctuated with serendipity. His achievements, anchored by perseverance and resourcefulness, could be attributed to his being raised by parents who grew up during the Great Depression. “My dad, who was a realtor like my mom, was into learning and tinkering with anything that needed fixing. His workshop was a glorified closet in the garage and that’s where we built a small car for a Cub Scout Pinewood Derby and repaired a lot of broken appliances.” As McGrew worked alongside his dad, the tenants of conservatism and living within ones means rubbed off. Consequently, he’s thrifty, especially in keeping overhead low and equipment inventory whittled down to only what’s necessary. He recently sold excess table saws and a CNC router that weren’t being fully utilized. And what about that chess set? If he finishes it, then what? “We’ll have a chess game down in the town square. Should be like a carnival with prizes for the champs.” And will McGrew play? “Ironically, I never took up the game. In a way, though, I think I play chess every day at the shop. I’m the king trying to defend my hide.” So far, he’s avoided checkmate with a fierce competitive spirit and is still very much in the game.